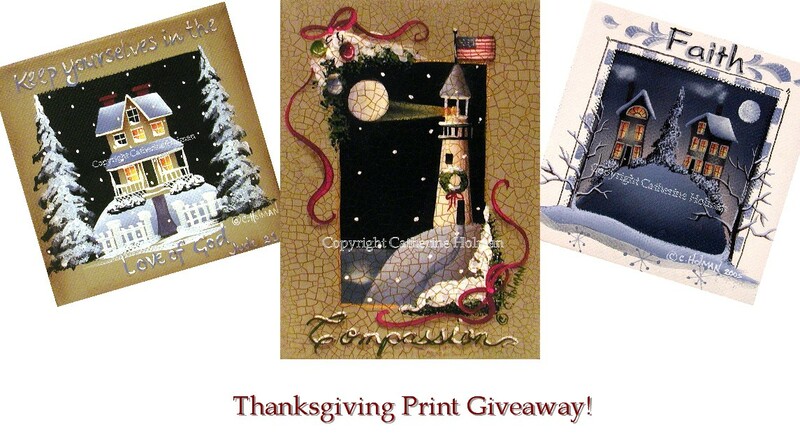 Catherine Holman Folk Art: Thanksgiving Giveaway! 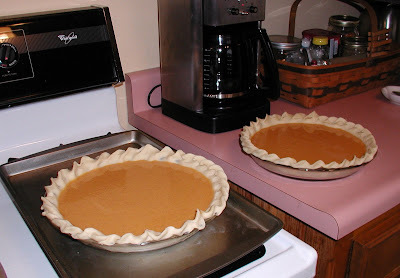 My mother, husband, and I have spent the day preparing for Thanksgiving dinner. My mother got all her pumpkin pies ready to go in the oven. 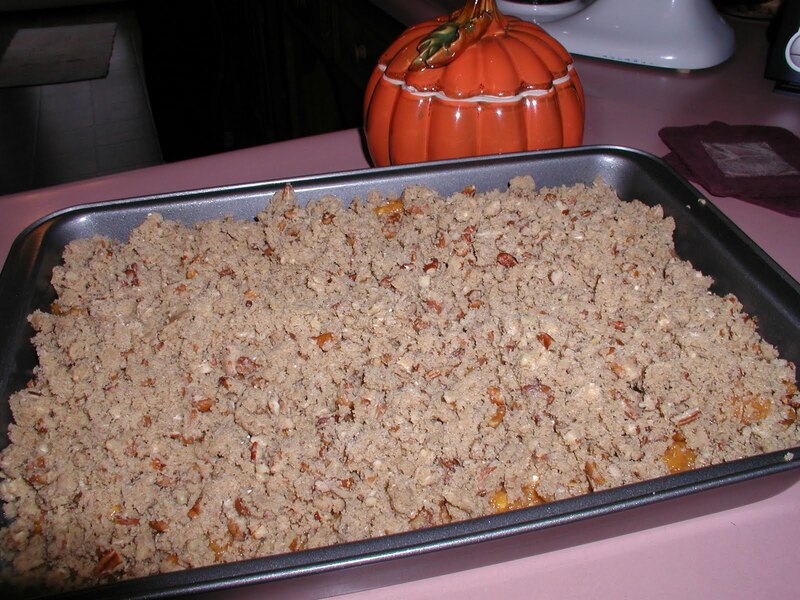 I mixed up my Sweet Potato Casserole (now ready to go in the oven tomorrow), baked a pecan pie, and mixed up and cut homemade noodles. Tomorrow will be so much easier with this much prepared ahead. My hubby will be spending the night running back and forth outside to keep an eye on the smoker. He's decided to smoke a turkey and a ham and must keep the fire going and adding water throughout the evening. My daughter, Amber, and son in law, Scott, will be staying with us this evening to help with the rest of the cooking. Our son, Eric, will be in Spain until June and will be dearing missed. You can check out his adventures in Spain on his blog Shuffle the Cards. He and some of the other teachers from the US are making a Thanksgiving meal for their new friends. I'm looking forward to hearing how their turkey turned out! With our son not home this year, it's really hit home how hard it must be for the families of our service men and women. Please keep them in your prayers this year when you give thanks around the table. These brave people are the reason for the freedoms that we have. I'm so thankful for all my blog readers and want to "giveaway" a free print of your choice. I appreciate all the comments and read each and eveyone. Just go to my Etsy Store, and come back here to leave a comment telling me which print you would choose if you win. I will draw a name on Monday. Please leave me your email address in with your comment if you don't have a blog so that I can contact you if you win. Good luck! Catherine..... I am in love with all of your beautiful paintings! Creamy Cupcake, perk up your day, Fairy cottage, yule tide cottage, christmas at Gramma and Grampas, Dreamy cupcake, Personalized tea shop, Bliss cottage! I'd love something I could keep out all year but your winter scenes are toooooo pretty to resist! And those cupcakes YUM!!!!! I am really excited about this give away...I know you will get alot of comments! Thank you for the opportunity to own one of your beautiful prints! I would be honored to win and display it in our home! I LOVE your artwork, whenever i need inspiration to crack out the paints i always have a look at your website! My mums a chef/inhome caterer so if i won i think i would like to give her a little bit of inspiration to with your Eat Cake Dessert Print :) Happy Thanksgiving! Hello Catherine - I agree with manola in thinking that you'll be flooded with entries for your generous giveaway. I certainly enjoyed my journey through your wonderful prints.... How to choose just one??? I'll choose It Came Upon a Midnight Clear as that is my favorite hymn and the colors go perfectly in our home. You have been blessed with an incredible talent!! I LOVE all of the prints so would probably have to say "eeny meeny miney mo!" Would probably choose one of your yummy cupcakes for my kitchen. I like the cup of carrot cake as I am a bunny person! Thank you for generously offering one of your prints to some lucky winner out there Catherine! Just want to thank you for offering one of your prints in a give a way this Thanksgiving Day. Your artwork is such an inspiration, especially to me who just recently found the joy of decorative painting. Thanksgiving seems to be a great holiday, with all the family being together and of cause wirth all that delicious food. Your thanksgiving givaway is a wonderfulidea. Hi.. am sure you will get tons of comments.. but I keep trying..lol I love Candy Cane cove..
Would have to request 'On a cold winter evening'. Love the blueness of it! They are all sooo nice! 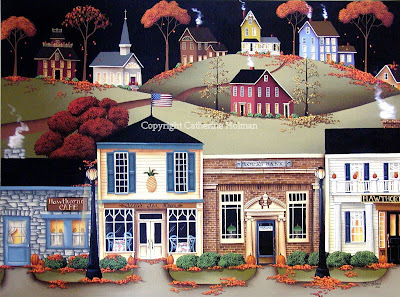 Oh Cathie, you know I love all of your prints and often tell you I'd like to crawl into the paintings but I dearly love the Leadville Train Station print. My grandpa was a train engineer and I've alway been fascinated by the old stations and trains. Smiles & keeping my fingers crossed! OH MY GOSH..i love them all...I think my favorite for sure, though, is Johnnie's One Stop Shop. Regardless, I have bookmarked your etsy, and sent the link to my sister, i know she will LOVE your prints as well. Happy Holidays! T.
Wow Catherine, this is a great giveaway! I would love to win a print of your wonderful art, so please count me in I really love "Christmas at Grandma's and Grandpa's House"
Hi Cathie! I love the Symmes Inn. It is so gorgeous! I got my Tea Shop print the other day and it is gorgeous! Dear Dear Catherine, what a privilege it would be to own one of your prints, I love them all but if I had to choose, it would have to be Johnnie's One Stop Shop... Love it. Please include me in your Thanksgiving give a way. What wonderful giveaway. It's hard to pick just one...so I think it would be Christmas in Fox Creek. Hope you and your family had a wonderful Thanksgiving. I am so inspired by your art, and your fabulous stories for each and every lovely piece. Catherine, like everyone else, I loooove your work!!! I love the I Will Praise the Lord print. I hope you had a wonderful Thanksgiving and thank you for doing this giveaway! Hi Catherine, I may be a bit too late for the giveaway since this is Monday already...but, I love all of your work. I'm glad to hear you and your family had a lovely Thanksgiving. Hope you had a wonderful Thanksgiving, Cathie! I hope I'm not to late to enter into your lovely giveaway. I love your Coffee Shope (Elizabeth's Coffee Shope). If you were to draw my name. I am just now feeling a bit better to read my favorite blogs. Its hard to type on my lap but I will get the hang of it. I can't wait to be able to get around again, until I can its couch bound for me. Take care and keep creating I enjoy reading all your posts. Your blog is very warm and inviting. Great art.